Some more free-form and 3D beadwork and the base necklace will be done. 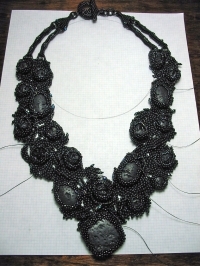 I love black, but I'm looking forward to start working on colorful ferns and flowers for the embellishments! Saby! That is looking so amazing! It was only as you started talking about colour that I realized what you might be planning! It really is an amazing piece of creativity! Hey Denise! :-) Thank you! Oh yes, it's not going to be all black. If you check the first post about Mauna Loa, I gave a rough explanation of the idea and there are links to a photo of ferns growing into the crevices of the old lava flows and some other plants that also grow there.